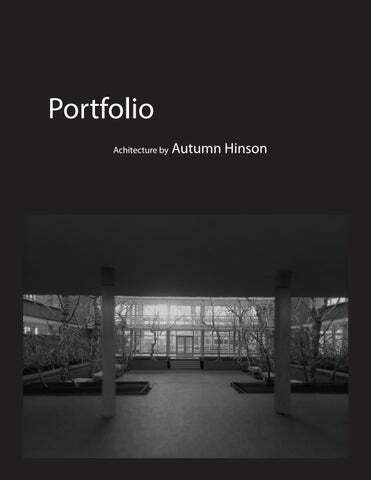 My name is Autumn and I am a 20 year old architecture student currently in my sophomore year. I am inspired by the everyday family that comes home to a residential masterpiece. Residential architecture is my passion and I have a strong interest in the professional practice of architecture. Presidents List - Tri County Tech. Case Study In this project, we case studied a house by a famous architect. I studied the Eames House which really embodies the simplistic lifestyle that the architect lived. I analyzed each floor plan and elevation and really dove deep into the layout of the home. The bottom photo is my model of the Eames house which is made out of basswood and museum board and it includes both floors in the buildings and the courtyard that famously splits the home from the studio. In this project, our first assignment was to work as a group and build a replica of our studio building and the coutyard in the center that we would use in the next assignment of this project. In the model and photo above, my contribution to the assignment was making the software files that were required, Rhino, AutoCAD, and Illustrator. I also built the multiple floors and steps to the courtyard. In this project, the second part of the assignment was to create a structure in the courtyard. I chose to design a gathering area that offered space for everyone at all levels. This design was inspired by stepping stones and the roof structure and parti above show that. I addressed how the design touched the ground and the sky by going 15 feet below courtyard grade and then I went several feet above the roof line of the existing building to give uninterupted views. The models on the previous page demonstrate how the light reacts with the roof structure and the panels that come down to the courtyard level create spaces for gathering. In this project, we had a workshop that preceded our main assignment and in this workshop, we analyzed wood joints. I chose the classic dovetail joint because it is a staple piece with corners. We were required to make a joint model in the woodshop and it taught me how to use the machinery to get these difficult cuts. This workshop led up to our project which was using heavy timber joinery to create a farmers market in Asheville, NC. The photo below is my model of the farmers market I designed. The site of this project was in downtown Asheville located near many extisting shops and an interstate overlooking the market. In this project, we had a workshop that preceded the assignment where we used the skill of adding and subtracting spaces by using wireframes and boolean boxes. The top two photos are of the workshop and the bottom photo is of the assignment. On the next page, the assignment required a space using the techniques we learned in the workshop before to create a space for a school in Spartanburg, SC. In this project, we had a workshop that preceded the assignment where we modeled and drew our knowledge on light wood framing. The drawing in the top left hand corner is a labeled wall section and to the right of that is an axon drawing of traditional wall framing. The bottom photo is my model of a traditional wall framing system that corresponds to the boolean workshop and project. In the project part of the assignment, we were required to design an exhibition and studio space for the community to use in Charleston, SC. Library Research In this project, I worked with a partner to do research on a library called Bibliotheque Sainte-Genevieve. His name was Mitchell Johnson and he assisted me on creating diagrams and drawings for our understanding of the building. We set out to analyze light and how it reacts to the large reading room on the top floor. We also set out to analyze the structure and circulation of the building. The structure in this building is the first of its kind in France, it was the first to use exposed cast iron framing in a public building besides industrial places. The barrel vault cast iron structure is unique to this building and it is the most predominant feature. When addressing circulation, we discovered that the only entrance is on the first floor in the center of the building. A person is forced to the back of the building without having access to the sides and this builds anticipation for the reading room upstairs as they approach the stairs leading up.